Sean McKay, VP of Business Development at American IRA-a National Provider of Self Directed IRAs, invites all to a free Webinar 'ABCs of Self-Direction' on March 14th. This is a basic webinar designed for those that would like to learn about Self-Directed IRAs. We provide these webinars free of charge as part of our mission to educate the public that their retirement account can invest in a variety of assets such as real estate, private lending, limited liability companies, precious metals and much more! Sean McKay says, "This is our 'basics' presentation for those looking to learn about the flexibility available to them within Self-directed IRAs. We provide these webinars free of charge as part of our mission to educate the public that their retirement account can invest in a variety of assets such as real estate, private lending, limited liability companies, precious metals and much more!" Cost: These webinars are open to the public and free to all! As a self-directed IRA administrator they are a neutral third party. They do not make any recommendations to any person or entity associated with investments of any type (including financial representatives, investment promoters or companies, or employees, agents or representatives associated with these firms ). They are not responsible for and are not bound by any statements, representations, warranties or agreements made by any such person or entity and do not provide any recommendation on the quality profitability or reputability of any investment, individual or company. The term "they" refers to American IRA, located in Asheville, NC. 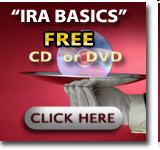 Visit Our Website For a Free Informational CD or DVD About Self-Directed IRAs.Educating the public that their retirement account can invest in a variety of assets such as real estate, private lending, limited liability companies, precious metals and much more!